Merrill Edge has a theory that people will become wiser after seeing an elderly version of themselves, thus Banf of America ages banking customer with online app to save for retirement. Face Retirement is an application that produces a digital aged image of the potential retiree and the cost of living around that age. According to Dean Athanasia, banking executive of BofA (@BofA_News), the only way they could get their clients to think ahead of the future is through the aging process. Two researchers at Stanford seem to support the idea in a study conducted last year. Study showed that participants who were introduced to their future selves were more likely to save for retirement, and those who were with a happier version of their selves saved more. Majority of the respondents also suggested that they should be saving for plastic surgery simultaneously. Athanasia thinks he started saving too late in his thirties. He estimated that an average 30-year old needs approximately a million dollars to retire comfortably at 65. However, 50% of the people aging 18-29 have nothing in their retirement accounts although there are a few outlets that cater to them. In response, the low-cost planning platforms at BofA can cater to young people via internet. The LearnVest is popular with the clients at twenties with prices starting at $89 for a three-month membership. The most complicated stage is the Portfolio builder which costs $599 a year. The Future Advisor plan offers basic money management for free and premium membership to rebalance your portfolios for 80% discount on traditional advisories. Since the app’s launch in December, 150,000 logged on to the program with 10% sharing their image on Facebook or Twitter. 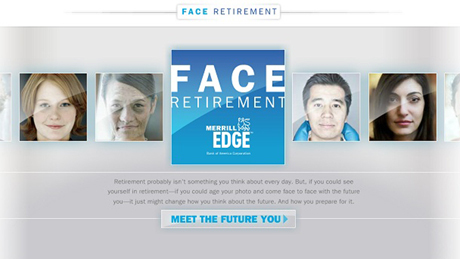 Do you think an app such as Face Retirement can drive retirement savings? After you have seen your older self, will you start saving for your own retirement as well? We invite you to share your thoughts about innovative banking apps, via twitter or on our Facebook page.